Weave ponytail is one of the most sophisticated way of styling your hair. The hair extensions can be a perfect choice to create the ponytail if you have a short to medium length hair. You can easily change your hair into a beautiful look ponytail with the help of weave extensions. Anyone can achieve this hairstyle within few minutes and use the extensions whenever you like to create the ponytail in your short hair. Begin the styling by washing your hair before applying moisturizing conditioner all over. Once your hair becomes fully dry try to brush the natural hair on one side of the head. Then create a ponytail with your natural hair and keep it secure with ponytail holder. Next twist the ponytail around the holder to create a simple bun and secure it using hair pins. Now take your weave extension track and attach it to base of your ponytail holder. Try to use hair pins to attach the extensions to the ponytail holder. 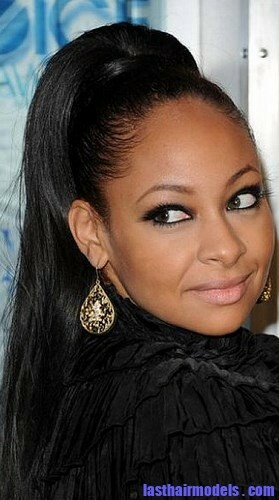 Then wrap your hair extension around the natural hair ponytail tightly and fasten it using more pins. Next take another hair extension behind the weft and send it around the base to prevent the extension seam from getting visible. You can use lot of hair pins to keep the weave extensions secured in place with the natural hair ponytail. At last you can style the ponytail as per your wish and mist it with a hairspray.